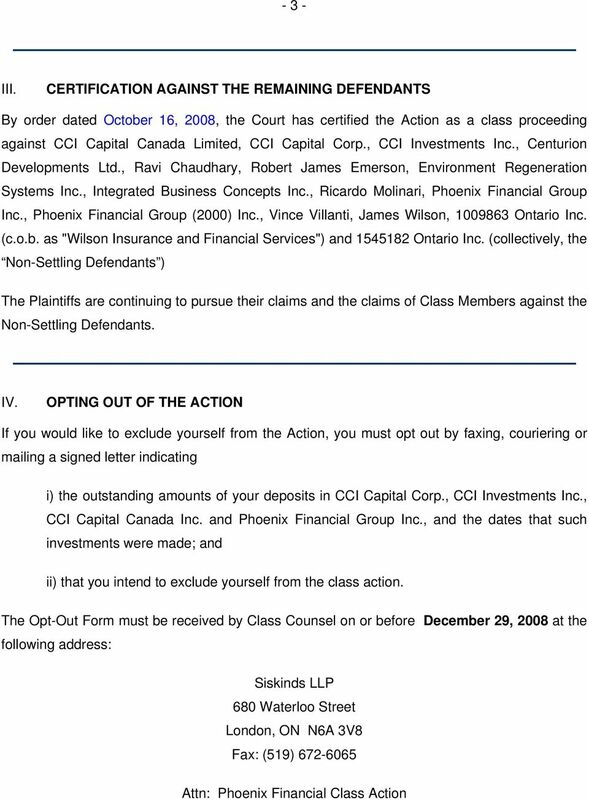 Download "IN THE MATTER OF THE PHOENIX FINANCIAL CLASS ACTION LITIGATION NOTICE OF CERTIFICATION NOTICE OF SETTLEMENT APPROVAL"
1 IN THE MATTER OF THE PHOENIX FINANCIAL CLASS ACTION LITIGATION NOTICE OF CERTIFICATION NOTICE OF SETTLEMENT APPROVAL PLEASE READ THIS NOTICE CAREFULLY. IT MAY AFFECT YOUR LEGAL RIGHTS. 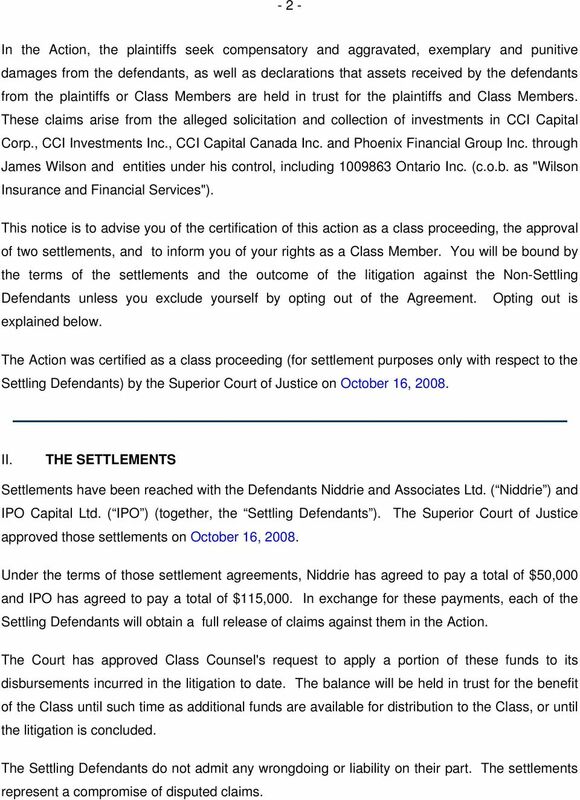 TO: Any person or entity who deposited, invested, or contributed funds in, through, with or to CCI Canada Ltd., CCI Capital Corp., CCI Investments Inc., and/or Phoenix Financial Group Inc. and who were clients of, received advice from, were solicited by, or received representations from Jim Wilson, Ontario Inc. (c.o.b. 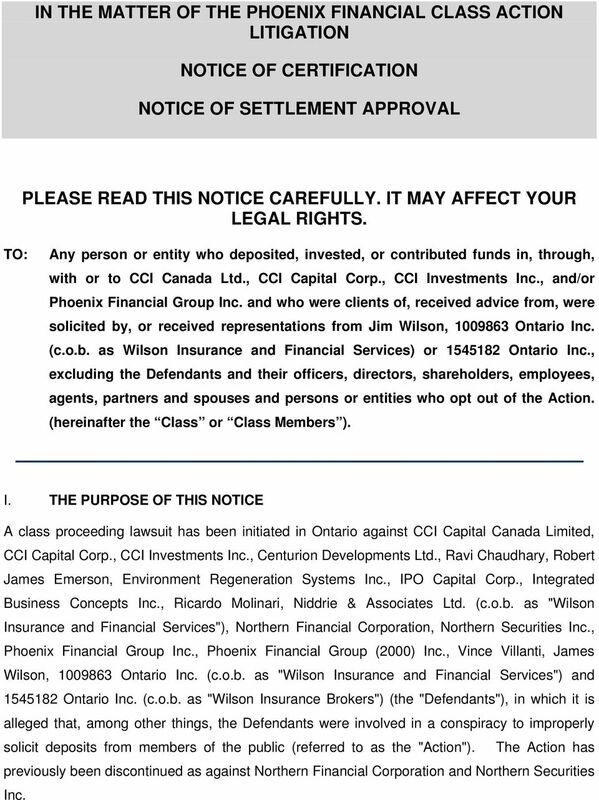 as Wilson Insurance and Financial Services) or Ontario Inc., excluding the Defendants and their officers, directors, shareholders, employees, agents, partners and spouses and persons or entities who opt out of the Action. (hereinafter the Class or Class Members ). I. 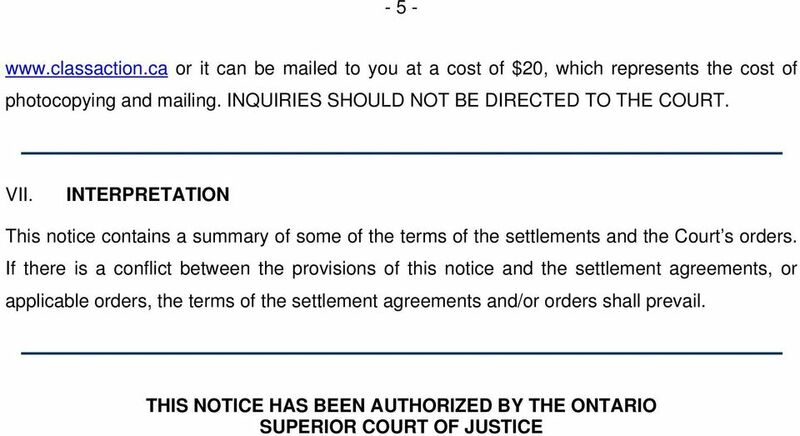 THE PURPOSE OF THIS NOTICE A class proceeding lawsuit has been initiated in Ontario against CCI Capital Canada Limited, CCI Capital Corp., CCI Investments Inc., Centurion Developments Ltd., Ravi Chaudhary, Robert James Emerson, Environment Regeneration Systems Inc., IPO Capital Corp., Integrated Business Concepts Inc., Ricardo Molinari, Niddrie & Associates Ltd. (c.o.b. as "Wilson Insurance and Financial Services"), Northern Financial Corporation, Northern Securities Inc., Phoenix Financial Group Inc., Phoenix Financial Group (2000) Inc., Vince Villanti, James Wilson, Ontario Inc. (c.o.b. as "Wilson Insurance and Financial Services") and Ontario Inc. (c.o.b. as "Wilson Insurance Brokers") (the "Defendants"), in which it is alleged that, among other things, the Defendants were involved in a conspiracy to improperly solicit deposits from members of the public (referred to as the "Action"). 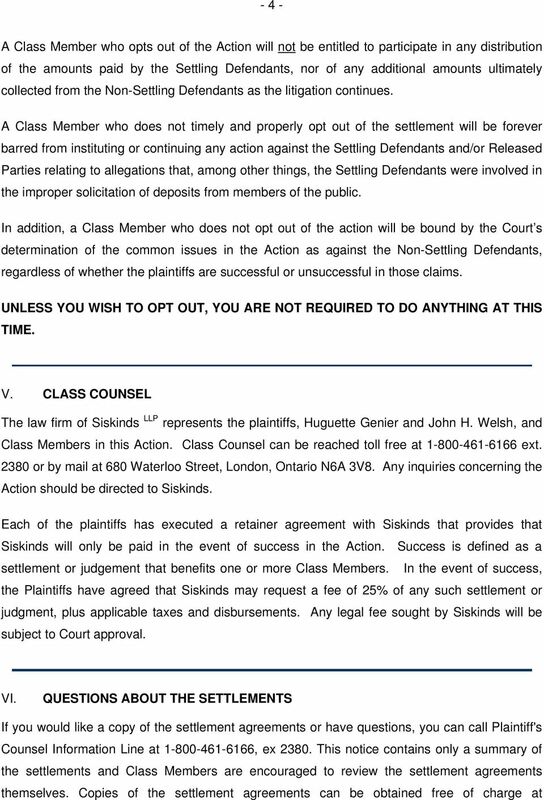 The Action has previously been discontinued as against Northern Financial Corporation and Northern Securities Inc.
2 - 2 - In the Action, the plaintiffs seek compensatory and aggravated, exemplary and punitive damages from the defendants, as well as declarations that assets received by the defendants from the plaintiffs or Class Members are held in trust for the plaintiffs and Class Members. These claims arise from the alleged solicitation and collection of investments in CCI Capital Corp., CCI Investments Inc., CCI Capital Canada Inc. and Phoenix Financial Group Inc. through James Wilson and entities under his control, including Ontario Inc. (c.o.b. as "Wilson Insurance and Financial Services"). This notice is to advise you of the certification of this action as a class proceeding, the approval of two settlements, and to inform you of your rights as a Class Member. You will be bound by the terms of the settlements and the outcome of the litigation against the Non-Settling Defendants unless you exclude yourself by opting out of the Agreement. Opting out is explained below. The Action was certified as a class proceeding (for settlement purposes only with respect to the Settling Defendants) by the Superior Court of Justice on October 16, II. THE SETTLEMENTS Settlements have been reached with the Defendants Niddrie and Associates Ltd. ( Niddrie ) and IPO Capital Ltd. ( IPO ) (together, the Settling Defendants ). The Superior Court of Justice approved those settlements on October 16, Under the terms of those settlement agreements, Niddrie has agreed to pay a total of $50,000 and IPO has agreed to pay a total of $115,000. In exchange for these payments, each of the Settling Defendants will obtain a full release of claims against them in the Action. The Court has approved Class Counsel's request to apply a portion of these funds to its disbursements incurred in the litigation to date. The balance will be held in trust for the benefit of the Class until such time as additional funds are available for distribution to the Class, or until the litigation is concluded. The Settling Defendants do not admit any wrongdoing or liability on their part. The settlements represent a compromise of disputed claims.